Thanks so much for stopping by my blog! I'm so impressed with all of your gorgeous creations. I hadn't seen any of these vintage step cards & bespoke frames before, so I made the mistake of checking out the website for Which Craft. Darn you for being an enabler! I love Stampscapes, and these two together are amazing. You have such a great eye for color. Your water and rocks look great the way you colored them. You can really see where the deeper water is due to your darker colors. Your highlighting with the gel pen adds motion to the scene. 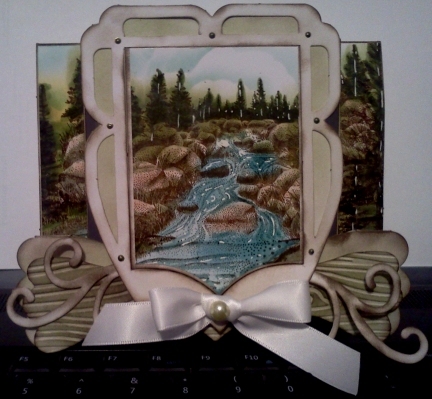 The only thing I'm not sure about is extending the scene all of the way to the edges of the card. Maybbe just keeping the scene within the middle frame would make it look more finished. Your color choices really fit so well with this scene. Great work!